Microsoft released the new build 14393 for Windows 10 Preview and Windows 10 Mobile Insider Preview a couple of days ago. As the Anniversary Update nears, some people started thinking this build will be the Anniversary Update RTM, as it didn’t contain many known issues revealed by Microsoft. On the other hand, users usually have something more to say about a new build than Microsoft notes, and build 14393 is not an exception. So, we wandered around Microsoft’s forums searching for problems in this build, reported by actual users, and in this article, we’re going to tell you what really is going on in Windows 10 Preview build 14393. As usual, we start our report with installation problems. It looks like no Windows 10 Preview build can go through without causing various installation problems to at least some users. “I cant update my pc to last build 14393 from current build 14372. I set all setting for insider fast. after cheking for update my pc say upe to date. but my phone build vesion is now 14393. help me for update to last build,” said one user on Microsoft’s community forums. Unfortunately, Microsoft engineers and other users of the forums didn’t have a proper solution for this issue. If you’re encountering networking problems upon installing build 14393, as well, we can recommend you to check out our article about internet problems in Windows 10, but we can’t guarantee solutions will surely work. Sound problems were more common in earlier Windows 10 Preview builds last year. 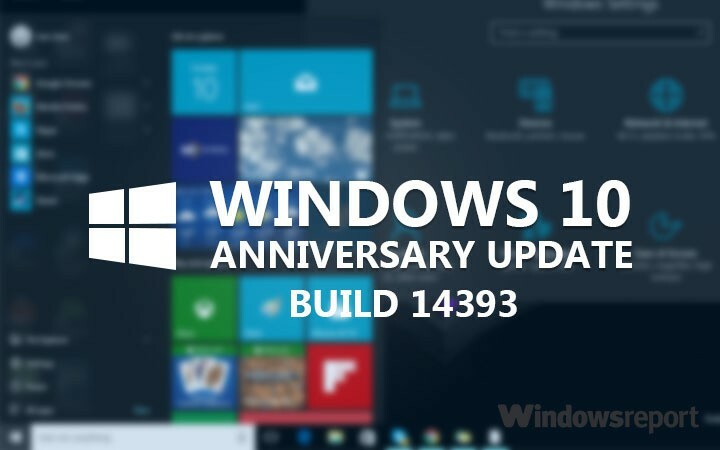 However, it looks like these issues started to appear again, as one Insider reported that sound on their computers stopped working upon installing build 14393. We have to mention that user who reported this problem didn’t precisely say it is related to the latest Windows 10 Preview build, so we’re not entirely sure this issue was caused by build 14393. All in all, if you also encountered sound issues in the latest Preview build, please let us know in the comments, so we can confirm this issue is indeed caused by the build 14393. You can also check out our article about audio problems in Windows 10, in case you need any help for this problem. Once again, engineers and other Insiders weren’t so helpful, so if you’re encountering a problem with Outlook in the latest Windows 10 Preview build, try running the Recovery Assistant for Office 365 tool, it might help. Issues with Microsoft Edge extensions in Windows 10 Preview builds are quite common, so we hope Microsoft will improve the stability of this feature once the Anniversary Update gets released. There are even some users who said multiple problems in Windows 10 Preview build 14393. For example, one Windows Insider said on the forums that the latest build caused problems with Home Group, dual boot menu, and Sticky Notes. Unfortunately, a confirmed solution for all these issues is still missing. This concludes our article about user-reported issues in Windows 10 Preview build 14393. Even though we wrote about a lot of recently reported problems, that doesn’t mean we covered everything. So, feel free to let us know in the comments in case you’re bothered by some issue we didn’t mention in this article.